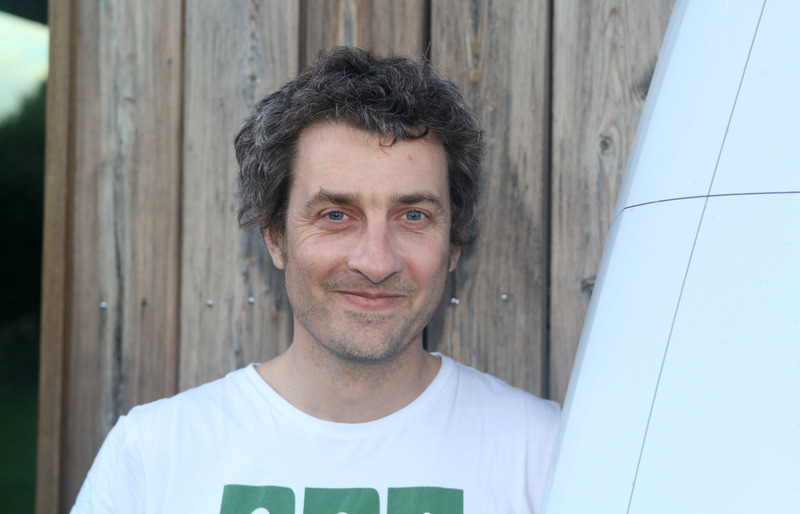 On Top Yacht Design n° 14 we published an exclusive interview (also published by other online magazine of the same publisher) by Emilio Martinelli to Guillaume Verdier (the Foil’s inventor) that we show below. But our research on foils didn’t stop there. We’ve kept on working on them. 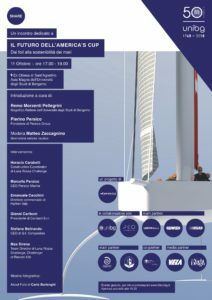 On Top Yacht Design 15, on the stands at the moment, we’ve published another exclusive interview to Mario Caponnetto, who is at the head of Oracle’s Computational Fluid Dynamics Department and has explained us how do the foils work (that we’ll publish soon). 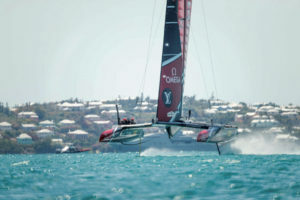 When the Emirates Team New Zealand AC72 rose up on its foils and flew for the first time in the Gulf of Hauraki, New Zealand, on September 6 2012, it opened up whole new era for sailing and racing. One is which Guillaume Verdier has been the driving force. The 48-year-old pen has given us, amongst many others, the new foil-packing IMOCA 60s that stole the show in the last Vendée Globe, one of the world’s fastest monohulls, the 100’ Comanche, the 2017 America’s Cup-winning Kiwi AC50, and two foiling maxi trimarans, Gitana 17 and Banque Populaire IX. 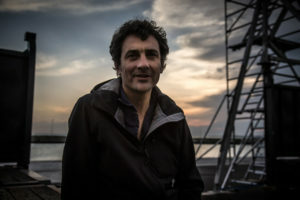 Last but very far from least, he also played a huge part in the new America’s Cup foiling monohull class for the 2021 outing of the world’s oldest sporting trophy. When did you decide that yachting design was what you wanted to do? In 1978, when I was 8 years old, I went to my first summer sailing camps in Brest in Brittany. My instructor told me that he was going to England to go to a naval architecture school. I remembered that. And ten years later when I was feeling bored in the Mathématique Supérieures (a type of French high school, ed.’s note), I remembered that and looked for that school. I found it in Southampton University! You’ve designed boats of all shapes, sizes and types. So do you prefer monohulls or multis? Do you have a personal favourite project? I like mono and multihulls. 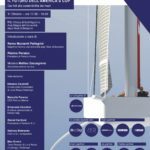 Monohulls are more complicated, particularly the Vendée Globe yachts because there are so many parameters, such as ballast, keel angle, foil adjustment, dynamic stability, to take intoaccount. Most important of all though is the human factor. But multihulls are incredible machines. I get passionate about a boat when the project develops well and there’s a nice story behind its conception. We are currently finishing a project with the Volvo Ocean Race team headed by Nick Bice (head of “boats and maintenance”, ed.’s note). That was very enjoyable and a great adventure for us that will produce many new IMOCA 60s. The America’s Cup is another kettle of fish altogether. But it was also a very successful adventure. Lastly, the maxi trimaran Gitana 17 is another fine story as far as we’re concerned. We feel like we are breaking secret codes. Thanks to that project, we turned a classic ocean-going multihull, the MOD 70, Gitana XV, into a boat that really can fly and is reliable: Giovanni Soldini’s Maserati Multi 70. Even though all your designs are very different, they do share a common philosophy. Could you tell us a bit about it? Regardless of whether it is slow, fast, monohull, multihull, foiled or not, a boat is always an object that has to follow the laws of buoyancy and friction. From a human perspective, our studio is unique, however. We are a group of collaborators from different sectors. But we’ve gathered together in a single work space. We all have separate projects but we like working together. My collaborators are behind the success of these projects. I have to name them all. It’s very important. It keeps us tight! So here are a few: Romaric Neyhousser, architect; Herve Penfornis, structures, project management and deck; Morgane Schlumberger, structures and project management; Bobby Kleinschmit, architect and performance; Véronique Soule, fluid-dynamics and performance; Nick Holroyd, architect; Leonard Imas and Romain Garo, both fluid-dynamics; Louis Pillot, designs. 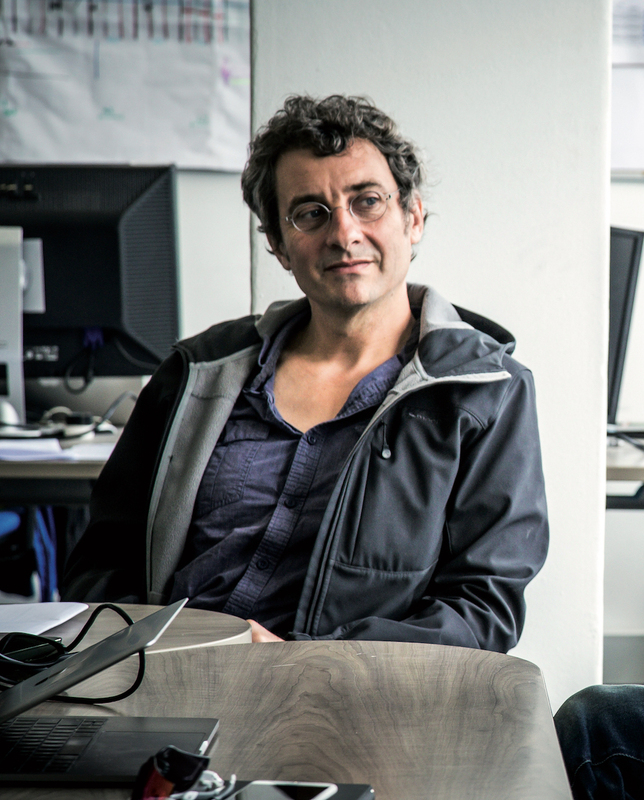 The Pure en Structure studio group in New Zealand is headed by Giovanni Belgrano and includes Adam Greenwood, Andy Kensington and Martin Bivoit. Hardly anyone knew your name until 2013. 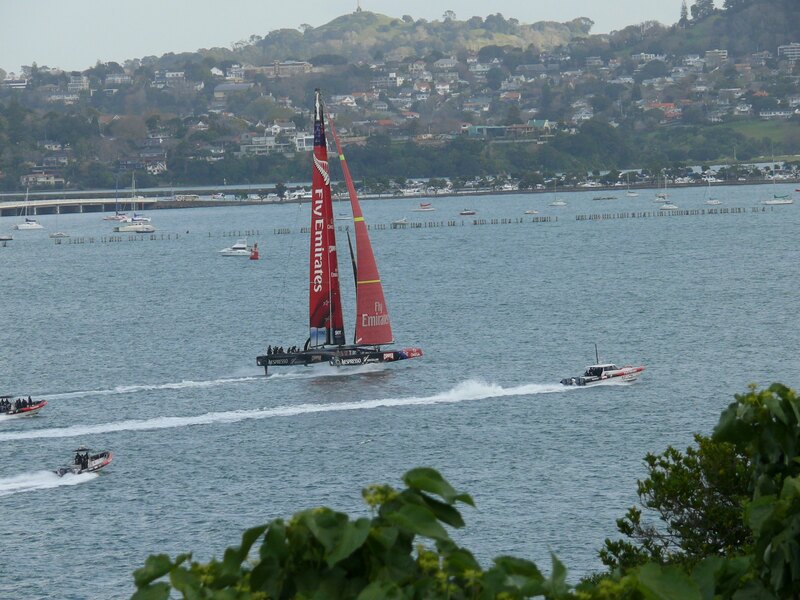 But since the America’s Cup of that year, everyone has been aware of foils and “the man that makes boats fly”. Where did you get the idea to make the Kiwi cat fly? This is not strictly an idea of mine but the direction we went in with Emirates Team New Zealand because we knew that that had the most untapped potential. We didn’t know how we’d get around the stability problems. So we said to ourselves that even though we didn’t know if we’d succeed, we’d give it our best shot. And we developed some excellent tools to help us understand the problems as best we could. I drew on the knowledge we’d built up and we put that together with our experience in ocean-going boats. Which today means about 20 boats for the single-handed round the world. What kind of difficulties are involved in putting foils on a monohull? Do they work better on multis? We had a lot of problems in getting the foils to work on monohulls. Today new ways forward are opening up and the problem is how best exploit the power that is theoretically available and controlled by just one person. We are also tackling stability problems in big swells. So with foils being so dominant, does that mean that the bottom and hull designs today are as crucial as ever or what is the story? Yes, they are because boats also encounter situations where there are light winds. Also there is a high possibility of a collision and damage to the foils. So the hull is still very important. During the last Vendée Globe, foil boats were damaged when they hit unidentified floating objects. That kind of thing can happen to anyone but does it mean that foils can only really be used in buoy racing in sheltered sea areas? 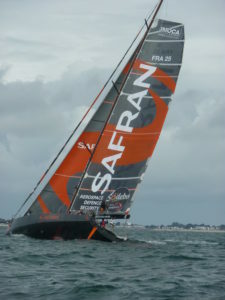 Not at all, foils are becoming extremely important in offshore sailing. But once again, we really do have to be able to provide for the kind of accidents caused by drifting objects. Speaking of which, are ocean-going multis an opportunity or a limitation? I’m asking because of Giovanni Soldini’s Maserati Multi 70’s misadventures. I think they are an opportunity. Govanni Soldini is genuinely redefining offshore sailing with foils that allow the boat to fly. We are not giving up (Verdier works closely with Soldini and the Maserati team, ed.’s note) despite the many collisions, particularly in the Pacific. And we are changing the architecture of both the foils and the rudders to protect them as much as possible from impacts. 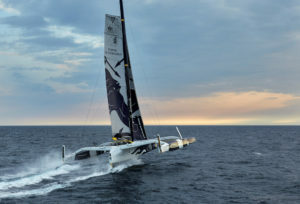 There will probably be foiling IMOCA 60 Opens in the next Volvo Ocean Race. How will the boat change to jump from being a single-hander to a crewed craft? We will definitely up the stability parameters and appendage control systems. There is no doubt that there will be winglets with a lift effect on the rudders. The crew will be well-protected from the sea and will spend a considerable amount of time adjusting the appendages. You contributed to the development of the new AC75 class rule. What are the crucial factors that will make the difference between the various designs? I had met Howard Spencer in New Zealand. 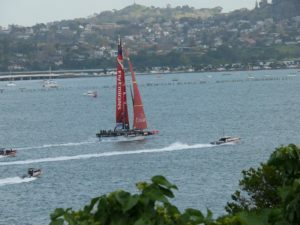 He was a client who asked me to design an unconventional monohull to sail in Auckland Bay. Ray Davis (the Emirates Team New Zealand’s tactician, ed.’s note) and I had a preliminary design in mind. Then Ray said to me: “Guillaume, you have to take away the keel. There’s too much in the water.” In the end, I said we could try to do something like Martin Defline’s twin-keeled monohull. 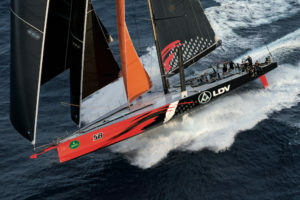 So I added lead to the foils and they were one and a half times more efficient than foils coupled with a canting keel. We presented the idea when the AC75 rule was created and it was then developed by the entire team. Crucial elements are the mainsail, the hull form and the foils. The rule for the new boat is quite open. 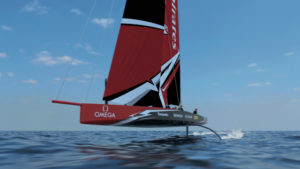 We’ll be seeing foiling monohulls for the first time in the America’s Cup in Auckland in 2021. Will there still be pre-start circling or will that be impossible now? There will be circling and very close duelling. Will the foils transition to regular craft and will we ever see a Verdier cruiser? I don’t know if I want to see them on a cruising craft but you never know. 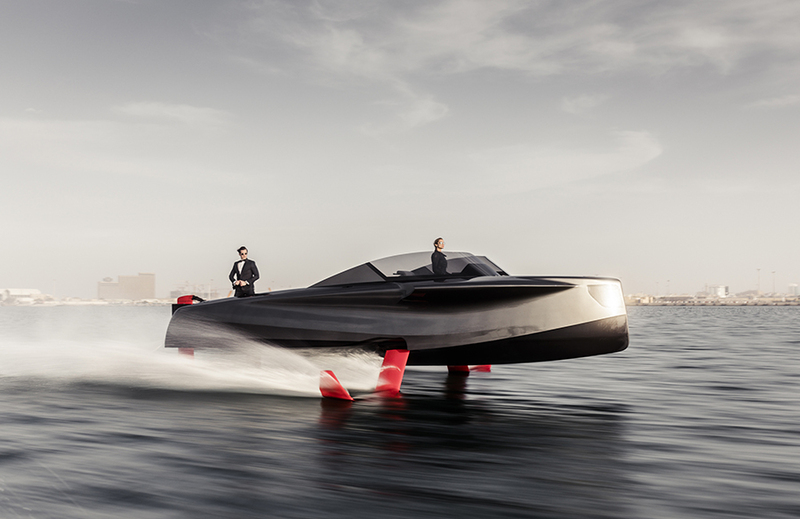 Final question: designing, building and launching your first boat is a thrilling experience. What do you remember about your first boat? My greatest memory is the finish of the 2008 Transat Jacques Vabre at Salvador de Baja in Brazil. 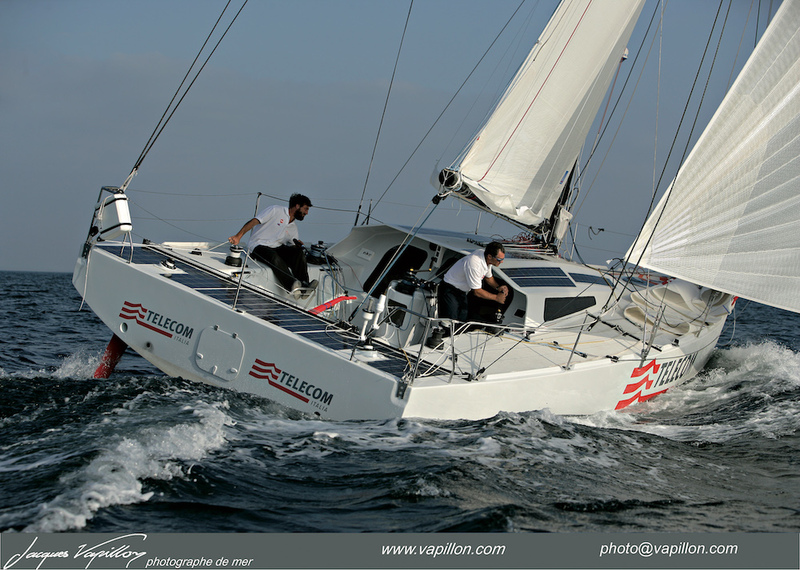 Marc Guillemot and Charles Caudrelier had a wonderful race aboard Safran 1, and Giovanni Soldini and Pietro D’Alì won the Class 40.